The TouchSmart 11 would make a good buy for students on a tight budget, but business users will want more power. If we were making the decisions at HP, we would have left the touch capabilities out and spent the money on a faster processor or a better screen. The HP Pavilion TouchSmart 11 e030sa reminds us a little of the netbooks of yesteryear - small, running a grown-up version of Windows, good battery life - but not much in the way of power. But this little tike also happens to be packing a quad-core AMD processor, so in theory it should be a little more impressive than a netbook - the majority of which had fairly basic processors. What really impresses us most about this little laptop is the price tag attached to it - just £330 and you have yourself a whole lot of very portable computing for practically nothing. At 11 inches, the TouchSmart is perfect for working in tight situations, such as a busy train, and the touchscreen gives it a boost of usability that you would normally expect in something much more expensive. 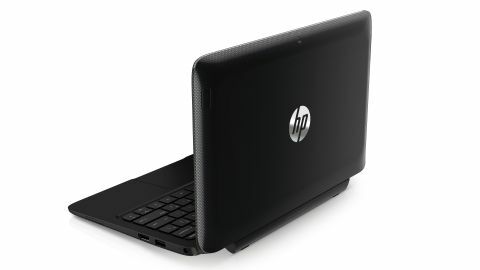 HP's no stranger to the world of budget computing though, with recent forays including the bigger HP Pavilion TouchSmart Sleekbook 15 and the HP Pavilion 14 Chromebook. Both performed really well at their respective price point. There's not much else available right now that can really compete with the TouchSmart. Sure, there are plenty of RT machines floating about, but the HP offers the full, unadulterated Windows 8 experience. The Asus Vivobook S200 came up trumps when we reviewed it last year, and it's one of very few laptops available now that are able to compete directly with the TouchSmart 11. It, too, offers an 11-inch touchscreen at a fair price, albeit a tad more expensive. You can certainly forget about the 11-inch Macbook Air - the TouchSmart is plain old bargain-bucket computing. Due to its pleasing price tag, as well as the small screen size and touch capabilities, we reckon HP's aiming this squarely at college students looking for something they don't have to be too precious about. Just chuck it in a bag and away you go. There's obviously scope for it to work within the corporate sector too, since it's running a full version of Windows, allowing you to install any application and work comfortably from the desktop. However, there are various constraints that might make it unsuitable. For instance, is the screen too small to allow you to work properly? And, is it really fast enough to meet the demands of a power user?